I was saddened to read that Dennis Hopper died today at the age of 74. Obituaries are starting to appear here and there, and most share a view of his career as erratic and uneven. What they fail to see is that Hopper was not an actor, but an artist who happened to do some acting on the side. And like every artist, he was prone to his mood swings and long spells of ennui and disenchantment. Dennis Hopper’s great roles were few and far between, but when they came, they grabbed us by the cojones and didn’t let go — until the next great role came along, which in some cases was a decade later. He gave us, among many others, a drug-crazed yet brilliant photographer in Apocalypse Now (1979), a murderous yet childlike sadist in Blue Velvet (1986), and a tough yet loving father in True Romance (1993). While his first role came in the landmark film Rebel Without a Cause (1955), it all began for Dennis Hopper with Easy Rider (1969), his directorial debut and a freewheeling ride on the winds of change that blew through the 1960s. The film is unapologetic to the point of approaching nihilism in its depiction of two bikers’ trek across the United States. Early in the film, the bikers prepare to embark on their journey. One of them waits at the side of the road to watch a plane fly overhead and land in a nearby airstrip. 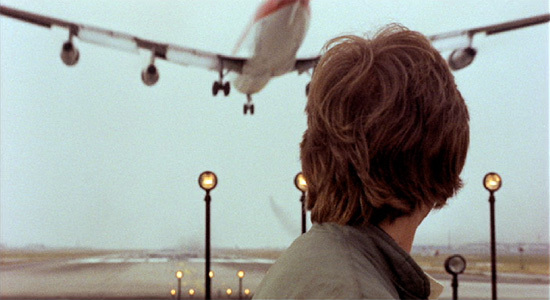 The scene is shot with a long telephoto lens, which shortens perspective, and the character and airplane appear quite large in the frame. The scene is serene and picturesque, and wordlessly expresses the theme of the entire film: an entire nation raging with anger and fear. The motion of the airplane from behind the camera, past Fonda, and into the distance suggests that the young characters are subject to the unfathomable power of change in an America in the midst of war: history, culture, and identity are all in flux. And with the screech of the airplane’s wheels on the runway, the riders’ journey begins. After much traveling, the two riders stop at a New Orleans graveyard to take a trip of a different nature. They drop some LSD and their journey takes an ominous turn as each man falls prey to his demons and tumbles into a well of despair. The graveyard transforms into a fragmentary vision of hell as they hallucinate their worst nightmares and most haunting memories. This is the flipside of the freedom that the characters have up to that point embraced, enjoyed and then abused through their travels and is a potent commentary on lost dreams and wasted youth. A few years ago, Dennis Hopper was at the Skirball Cultural Center to introduce Luis Buñuel’s Viridiana (1961). During the Q&A, I asked Hopper about his role in David Lynch’s equally surreal Blue Velvet, which I called “the last American Surrealist film.” In response, he briefly corrected me by declaring it not the last but the first, and went on to give an eloquent description of his approach to the role. That’s Dennis Hopper in a nutshell: His career was one of firsts, where instead of following trends he created them. Then he quietly sat back as they were emulated, copied, and finally banalized. Dennis Hopper, you shall be missed. This story is from Meedo’s upcoming book montagespace: Cinema and the Making, Un-Making and Re-Making of Architecture. Please feel free to contact us for more details and read related stories here.